Computer Science is All About People! We are students fascinated by the transformational potential of computing in the world; faculty, who undertake primary research in the field and share our discoveries (and the process by which we made them) with our students; staff, who support the efforts of students, researchers and teachers alike in the delivery of our programs of enquiry and instruction. Together, we explore our discipline to discover new ways in which computing can change the lives of people everywhere! July 1968 marked the opening of the Department of Computer Science, which was first established as a university department reporting directly to the President. It was initially led by a single professor. Prior to 1968, some computer-related courses were offered in Math, Engineering, and Commerce. Fortunately, Computer Science was able to draw on professors from those colleges to teach courses since there were few people with formal education in the field at this time. The Department initially offered B.Sc. General, B.Sc. Advanced, and M.Sc. (special case) degrees. The honours degree in Computer Science and M.Sc. programs were created in 1971 and 1972, respectively. By the mid-70’s, the Computer Science faculty had grown to nine members and undergraduate enrollment had increased by 70 percent. In 1980, organizational changes at the University prompted Computer Science to accept an invitation to join the College of Engineering. The newly formed affiliation assisted in developing the first Engineering and Computer Science dual-degree program in 1984. Computer Science would eventually move into the Engineering building. 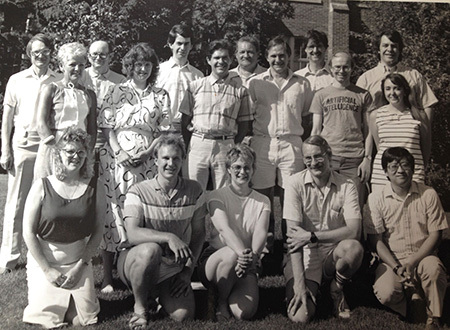 The early 80s also marked an expansion in the Department's research infrastructure. A Ph.D. program was formally approved in 1986. As the 90s hit, the Department's research activities continued to increase. In 1995, the Institute for Scientific Information (ISI) ranked the Department second in Canada for research impact based on average number of citations per paper over a 14-year baseline, and first in Canada over a four-year time frame. The Department requested to join the College of Arts and Science in 1994 as it became clear that the Department's philosophies and programs were better attuned to arts and science. In 2000, the Department became the first Computer Science department to have a software engineering program accredited by the Computer Science Accreditation Council (CSAC). Most recently, the Department took the lead in creating a Bioinformatics program together with various biological science departments in 2002. In 2004, the Department found a new home in the Thorvaldson Building and Spinks addition. Computer Science has grown to be a strong academic department of 30 faculty and 16 staff providing a variety of disciplinary and interdisciplinary undergraduate programs, and maintaining one of the largest graduate programs on campus. Learn more about the various awards won by our faculty and students.